Welcome to the The Supercar Registry. This forum is for general discussion about Supercars and/or Musclecars. My not so Little 69 Project. This is for the discussion of non-Chevrolet Supercar/Musclecars. This forum is for questions concerning Supercars & Musclecars, such as options, production numbers, dealer offerings, etc. This forum is for discussing anything dealing with racing. For updates and questions regarding our forum sponsors. 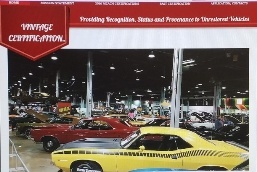 This is a section for tips, examples etc on preservation versus restoration on cars. This area is for "off topic" discussions not directly pertaining to Supercars/Musclecars. A forum dedicated to our fallen comrades. section for posting shops, garages, ideas, show and tell etc. This forum is for the discussion of Yenko Chevrolet. This forum is for the discussion of COPO cars from the United States. This forum is for the discussion of COPO cars from Canada. This forum is for the discussion of Baldwin-Motion. This forum is for the discussion of Berger Chevrolet. This forum is for the discussion of Fred Gibb Chevrolet. This forum is for the discussion of Nickey Chevrolet & Bill Thomas Race Cars. This forum is for the discussion of misc. dealer cars. Classic auto insurance questions and discussion from MK Insurance Co! Questions, answers, and Mecum auction news & updates available here! A discussion area for 427King.com stuff. This forum is for general discussion about The Supercar Reunion. The Reunion in not part of Yenko.net or the SYC. It is a separate event put on by Tom Clary but announced here. This forum is for discussion of future and past Supercar/Musclecar events. Listing in classifieds is for Paid Members. If you can't see the link to click to post an ad it is probably because you are not a paid member. There are no commercial ads allowed except by site sponsors. All for sale or trade ads need to have a price, unless it listed in a no reserve auctions. No listing for offers only, but you can list something with a price. Ebay is allowed as long as there is a "buy it now". Potential buyers can inquire about the item being sold. If the sellers description has an error or not accurate you should PM the seller and or notify a moderator. No negative comments in the classified sections. We all have opinions, but we don’t need to bash people for placing an ad that doesn't agree with our idea of value etc. Members should be able to place an ad without worrying about being bashed. Members listing items or vehicles are expected to stand behind their sale for at least 60 days or risk losing classified privileges and possible access to the forums. We want this site to be a place to be able to trust the person we are buying from. The seller & buyer are solely responsible for the terms and conditions of the transaction. Bumping your ad to the top should only be done after a month. It's only fair to members posting new ads that they be seen at the top of the page and not unnecessarily bumped down. A place to post links to Ebay and other interesting ads. If it is your ad you need to post the reserve. This is a section where Members can post wanted or for sale stuff with the intention of giving members a deal on parts to use on their personal projects. Maybe you even give it away. This is not a place to get that part for almost free so you can resell it on Ebay or throw it on the car you are going to sell. I think you get the idea. This forum is for Supercars and/or Musclecars for sale. You need to be a paid member to post an ad in these classifieds. All items must be priced, unless listed in a no reserve auction. If listing a link to your ebay ad the item must be no reserve, have a "Buy it now" price or disclose here in the link what the reserve is. This forum is for Supercars and/or Musclecars wanted. You need to be a paid member to post an ad in these classifieds. This forum is for memorabilia & parts for sale. You need to be a paid member to post an ad in these classifieds. All items must be priced, unless listed in a no reserve auction. If listing a link to your ebay ad the item must be no reserve, have a "Buy it now" price or disclose here in the link what the reserve is. This forum is for memorabilia and parts wanted. This is a work in progress. We will be listing Supercars known and submitted. This is our work in progress attempting to assemble a data base that people can refer to when trying to find out about a Supercar. This forum is for suggestions, comments, or problems relating to the message board and/or web page. Most users ever online was 1,418, 06-22-2018 at 02:58 AM.